No press flies to Cambodia. Pre-game Ep1: "I'm A Mental Giant" Ep2: "Kindergarten Camp"
As is often done, tribes are brought in by boat, and have one minute to gather as many items as they can, and board a raft. Much splashing and tossing ensues. Tribes must jump off a dock, swim to and climb into a boat, then one person at a time (Neal, Aubry; Darnell, Jennifer, Jason; Michele, Tai) must dive down and untie four paddles. Once all 4 paddles are retrieved, the tribe paddles to shore, then hauls the boat onto a cradle. After clipping in to a rope, they attach wheels to the boat and push/pull it up the hill, to the puzzle station, where they choose between a puzzle or dexterity test (all choose puzzle). 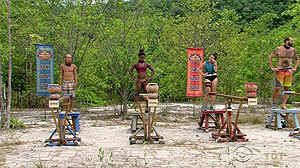 Aubry and Liz solve the puzzle first for Brains, winning immunity and a fire-making kit. Despite a huge initial Beauty lead, Julia and Anna barely finish one piece ahead of Jennifer/Scot for Brawn. Beauty wins immunity and flint. Ep1 RC/IC: "Wooden Ships" - Brains wins, Beauty second. TC1 - Darnell voted out (3-3 [4-0]), 17 left. 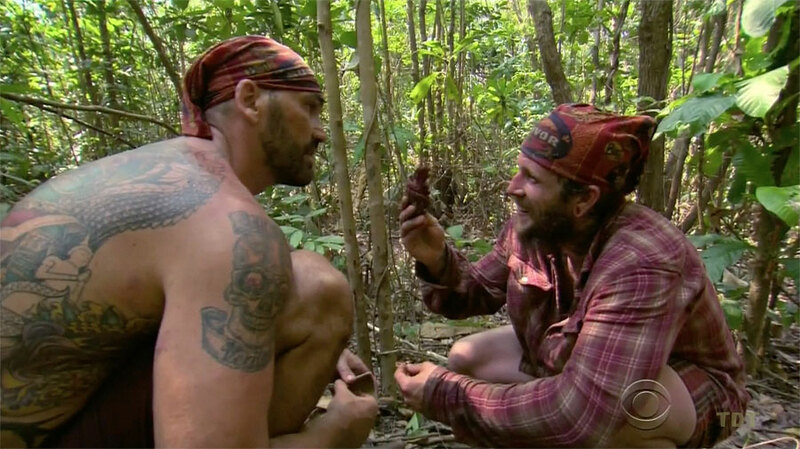 While his tribe is in the water, Tai finds a hidden idol clue tucked in a tree, which directs him to dig up the actual idol at the base of the tree. Unfortunately, it's in a locked box, and the instructions tell him to find the key in another tree. After injuring himself attempting to climb up, he gives up. Julia and Debbie sit out. Five tribe members must carry a 300-lb log along a river/lagoon, under and/or through various obstacles, until finally reaching a cradle. There, they unwind a string and ball from it, and one person (Scot, Caleb, Peter) must use a slingshot to knock down two distant targets. All three tribes are tied at one target each, then Beauty wins, Brains finish second. 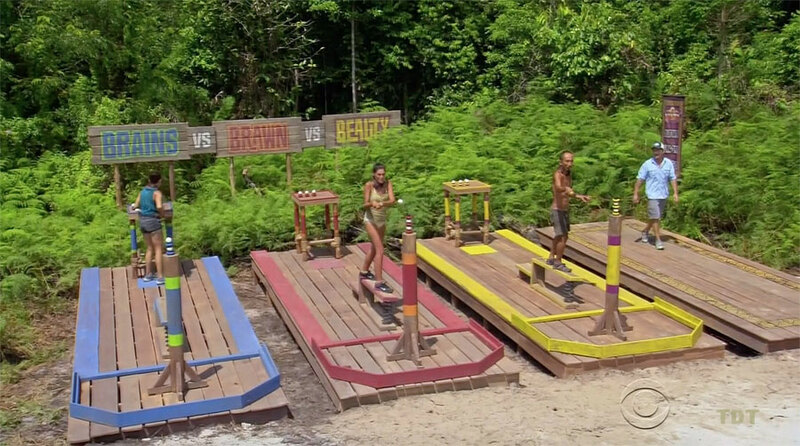 In addition to immunity, Beauty wins a massive fishing kit and boat, Brains a smaller fishing kit. Ep2 RC/IC: "Dragging the River" - Beauty wins, Brains second. TC2 - Jennifer voted out (3-2), 16 left. Ep3: "Circle of Life" Ep4: "Signed, Sealed and Delivered" Ep5: "The Devils We Know"
Tai apparently finally gets around to reading the tool instructions, and heads back into the jungle with a long stick. While he can't find the tool any more, he still releases the key, unlocks the idol, and learns about its potential superidol properties. Tai finds the Beauty idol. Alecia finds an idol clue while searching with Cydney. Jason catches them, but doesn't interrupt. Cydney locates the idol box (and tool instructions), but doesn't tell Alecia. She does, however, tell Scot and Jason, who race back to where Jason saw them, where Jason finds the tool instructions. Scot then uses the tool to release the key. Jason and Alecia scramble to grab it, Jason does so. They then open the idol box, remove the idol, and read the instructions. Jason keeps the idol. 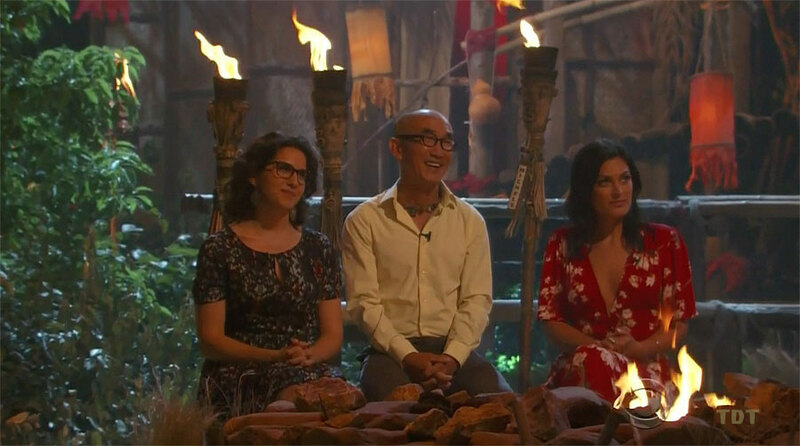 Aubry and Joe, Anna and Michele sit out. Tribes swim to a canoe, where one person climbs in and hands off three bags of rice to their tribemates. 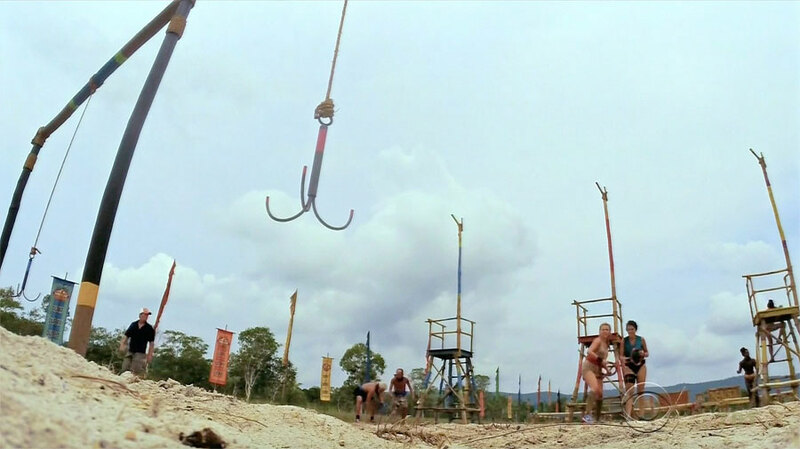 The tribe must pass the bags through a small hole in a gate, then carry them over a balance beam to the beach. There, they cut the bags open and retrieve three balls, all of which must be maneuvered to the top the 'swiss cheese' board from Worlds Apart. Julia, Tai, and Caleb place all three balls for Beauty, which finishes first, chooses comfort items for reward. Liz and Peter place a ball each for Brains, Jason and Scot for Brawn. 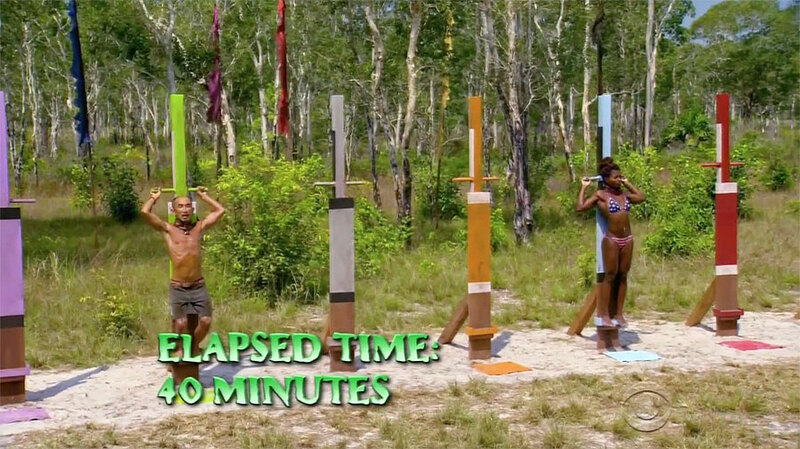 The final immunity slot comes down to a split-second race between Cydney and Debbie. Cydney wins second place for Brawn, which gets 'emotional items' for their reward. Ep3 RC/IC: "Rice Race" - Beauty wins, Brawn second. TC3 - Liz voted out (2-2-2 [3-0]), 15 left. Neal, Anna, Julia sit out. 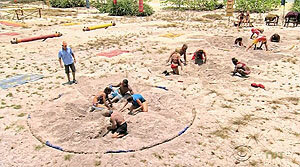 Contestants must cross obstacles, then dig up three bags from a large sand pit. The digging takes ~45 minutes in full, 120-degree sun. Brains (Peter, Debbie, Aubry-1 bag each) get their bags first, complete the final stage (place 6 balls in a skee-ball course: Aubry-2, Peter-3, Debbie-1) before the other tribes get their third bag. Beauty gets their third bag next (Nick-2, Caleb-1). 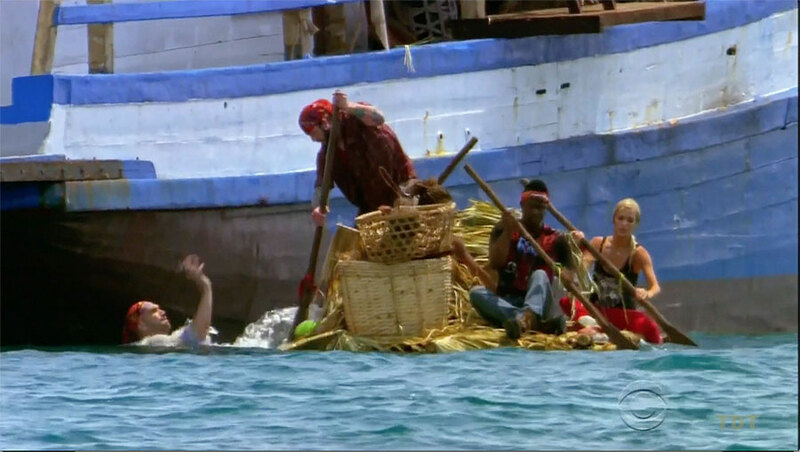 Caleb is shooting as Debbie passes out from heat exhaustion. Caleb (4+) & Nick (1+) switch off, place five balls. Then Brawn gets their third bag (Scot-2, Jason-1), place three balls (Jason-1, Scot-2) making it 5-3. Caleb sinks final ball for Beauty, winning second place. Brains get coffee/kitchen items reward, Beauty gets spices. Ep4 RC: "Dig It" - Brains win, Beauty second. After the Brains win the challenge, Debbie gets medical attention for heat exhaustion. 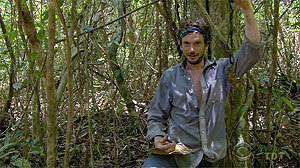 The challenge continues, as Caleb secures second place for Beauty. Then Caleb collapses. As Caleb is getting tended to, Cydney collapses, too. The entire crew helps tend to the fallen contestants. Eventually, Debbie and Cydney return to normal temperature, but Caleb is pulled from the game and helicoptered out to a hospital. Tai, Joe sit out. Runners (Alecia, Cydney; Julia, Anna; Peter, Debbie) go into jungle, retrieve 3 puzzle pieces. Swimmers (Jason, Scot; Michele, Nick; Aubry, Neal) swim out, dive for 3 more pieces. Then two more people must use the pieces to complete a snake puzzle: Anna, Julia; Cydney, Alecia; Neal, Debbie. Peter swaps for Debbie, Brains first. Nick swaps for Anna. Beauty second. Brawn loses again. 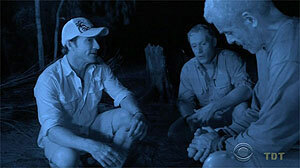 Ep4 IC: "Snake, Rattle & Roll" - Brains win, Beauty second. TC4 - Alecia voted out (3-1), 13 left. 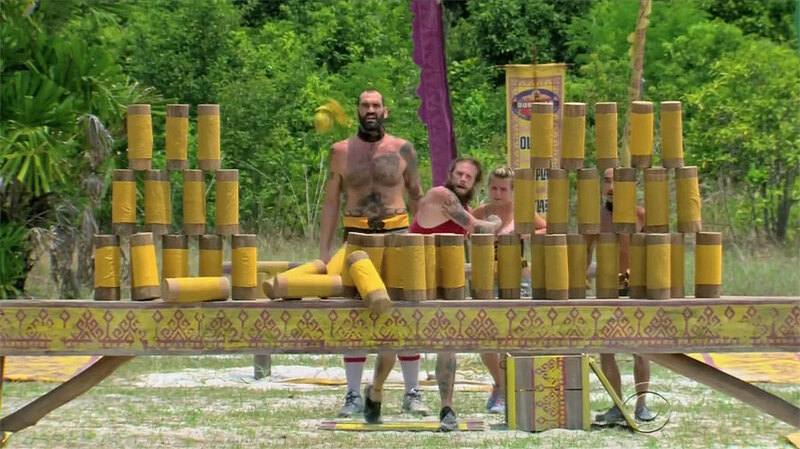 All three tribes are forced to pick wrapped buffs from a tray of 13: six blue, six yellow, and one red. 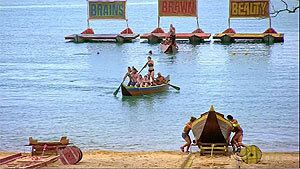 Whoever draws the red buff will have to stay at Brawn beach until after Tribal Council. That person is Julia. 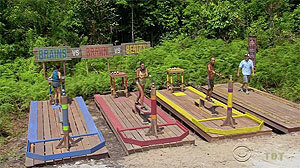 New tribes are Chan Loh (blue): Debbie, Neal, Cydney, Jason, Michele, and Nick; and Gondol (yellow): Aubry, Joe, Peter, Anna, Tai, and Scot. Tribal swap, two new tribes of 6 people, except Julia. Julia ineligible due to red buff, not present. Divers (Scot &Aubry - Gondol, Nick & Jason - Chan Loh) retrieve a net with fish puzzle pieces tied to it from the water. Middle pair (Joe & Tai - Gondol, Michele& Cydney - Chan Loh) untie fish from nets, put them on hooks, carry pole with fish to the puzzle stage. Final pair (Peter& Loh) work the fish puzzle. Neal and Debbie breeze through it, and Chan Loh wins! Ep5 IC: "New School" - Chan Loh wins. TC5 - Anna voted out (5-1), 12 left. 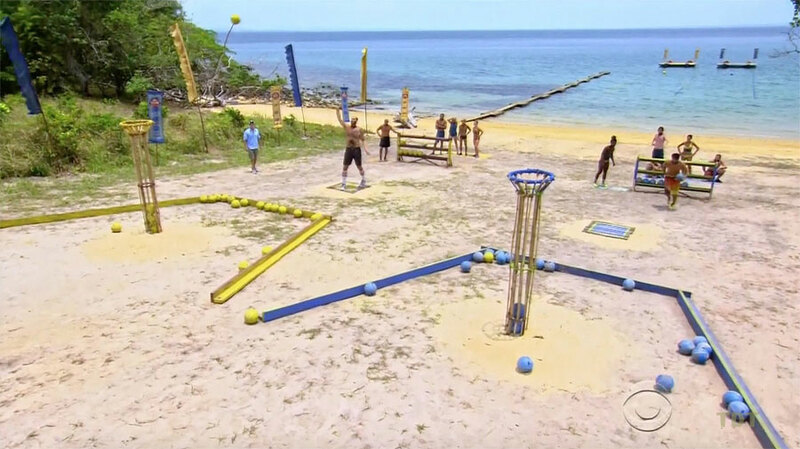 Ep6: "Play or Go Home" Ep7: "It's Merge Time" Ep8: "The Jocks..."
Divers (Aubry; Michele) release a net full of buoys. Swimmers (Neal, Debbie, Jason; Julia, Tai, Peter) move them to shore, put all 20 on a rack. Shooters (Scot, Joe; Nick, Cydney) must put 10 in a hoop. Only Scot and Nick actually shoot. Nick briefly leads 7-5, but Scot wins, 10-8. Gondol gets a feast. 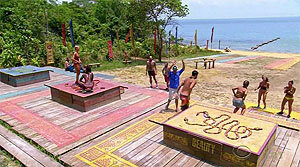 Ep6 RC: "B, B & B" - Gondol wins food. Ep6 IC: "Get Over It" - Chan Loh wins. TC6 - Peter voted out (4-2), 11 left. The Chan Loh tribe is given five minutes to gather its items, then is transported to Gondol camp, where they merge. The new tribe is named Dara. Hilarity ensues. Contestants must stand on a small perch, holding a disc with a ball on it for five minutes. Falling off or dropping the ball results in elimination. Round 1 (5 minutes, 1 ball) order of elimination: 11.Joe, 10.Debbie (almost immediately), 9.Jason (with seconds remaining). Round 2 (5 minutes, 2 balls): 8.Michele, 7.Neal, 6.Scot (all within 20 seconds), 5.Cydney, 4.Aubry. Round 3 (3 balls): 3.Julia, 2.Tai, 1.Nick wins! Ep7 IC: "Rollerballs" - Nick wins. 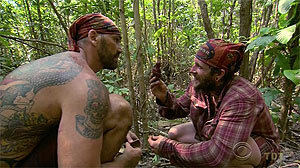 After Dr. Rupert checks out Tai, Scot, and Aubry's scrapes and infections, he finally gets to Neal's back scab and 'Mt. St. Neal' below his knee. Deeming the risk to Neal's knee too severe, Dr. Rupert recommends Neal be pulled from the game. Neal leaves without handing his idol off to anyone. Julia and Aubry are captains, pick the teams (not shown). Each team must transport one person from one platform to another across the water, using 'stepping poles.' 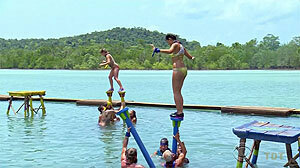 Once across, the entire team must then climb up on top of a stand together (as seen in Cook Islands). 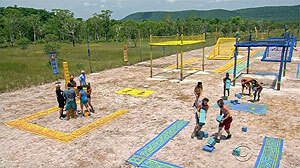 Yellow team (Scot, Nick, Debbie, Tai, Julia) vs. Blue team (Aubry, Joe, Michele, Cydney, Jason). Yellow team wins ice cream, delivered to camp. 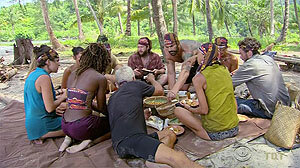 Ep8 RC: "United We Stand" - Julia, Tai, Nick, Scot, and Debbie win ice cream. Ep8: "The Jocks vs. The Pretty People" Ep9: "It's Psychological Warfare" Ep10: "I'm Not Here To Make Good Friends"
Contestants must stand in an uncomfortable position - on a narrow block of wood, with their hands grasping a bar behind their head - for as long as possible. Order of elimination: 10. Julia (out just before Probst arrives with food, ineligible to eat). 9.Scot, Tie-7,8.Jason,Joe, and 6.Michele all drop out for food. 5.Debbie drops out during the eating. Then 4.Aubry, with 3.Nick right behind. Shortly after the 40 minute mark, 2.Cydney drops out, and 1.Tai wins! Ep8 IC: "Uncomfort-ably Numb" - Tai wins. TC7 - Nick voted out (6-2-1-1), 9 left. Challenge requires two teams of four to unbraid a rope to which they're all tethered, then knock blocks off a ledge with sandbags. 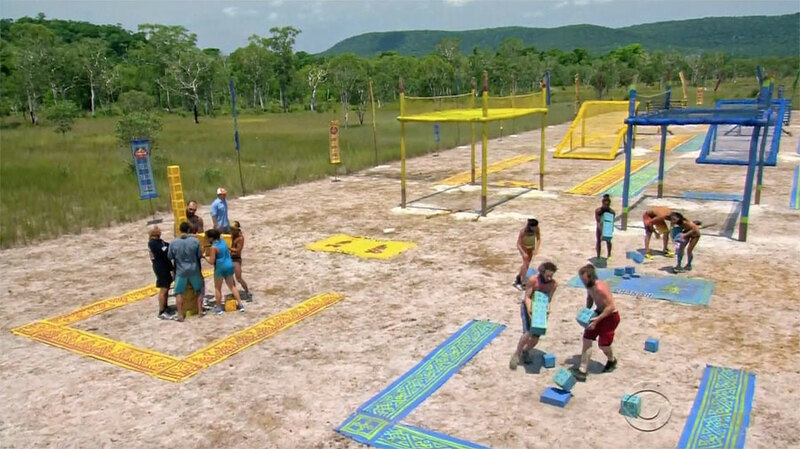 Probst allows the contestants to distribute themselves into teams, Joe volunteers to sit out. Julia opts to go with Scot/Jason/Tai. Joe roots for the women's (blue) team, and will get reward if they win. Yellow team is first to unravel. Scot & Jason throw sandbags. Cydney & Debbie throw for the blue team, Debbie almost catches them all the way up, but eventually, Jason wins. Yellow team gets Chinese food delivered to camp. 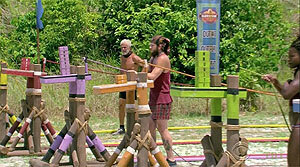 Ep9 RC: "Knot Your Fault" - Julia, Tai, Scot, and Jason win. 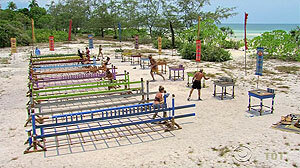 Contestants must stack blocks along a beam while avoiding a trip obstacle (basically, a horizontal trellis). Then they must knock the blocks over, like a line of dominoes, eventually hitting a gong. Knocking blocks over other than all at once requires all blocks to be returned to the starting table before continuing. Tai, Julia, Michele, Debbie, Aubry in the lead. Tai, Aubry knock all blocks over. Michele goes for the win, blocks don't fall down. Same for Debbie. Jason: nope. Debbie. Nope. Julia eventually wins. Ep9 IC: "Backed Up" - Julia wins. TC8 - Debbie voted out (4-3-2), 8 left. Before the challenge starts, contestants must choose whether to compete for advantage, food, or love (letters from home). They will compete solely against people who make the same choice. Advantage: Tai, Cydney, Aubry. Food: Scot, Jason, Michele. Letters: Julia, Joe. Love: Joe first out, very quickly, Julia wins. Food: 3.Scot out, then 2.Jason. Michele wins a cheeseburger and fries. Advantage: 3.Cydney out, then (10 minutes) 2.Aubry out, 1.Tai wins advantage (extra vote). 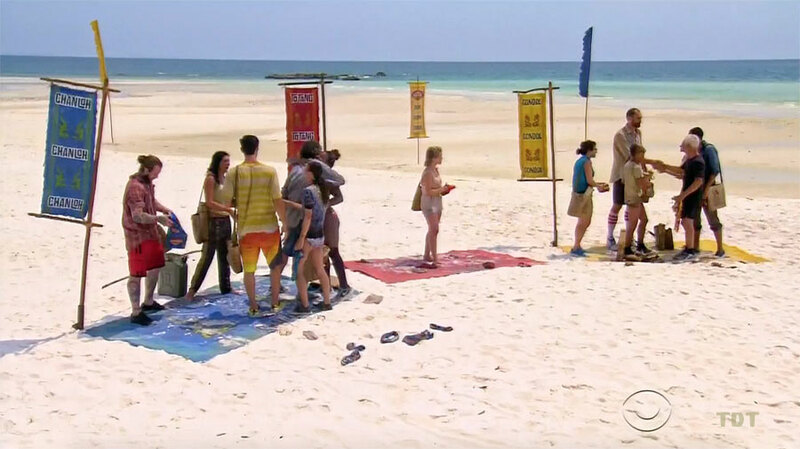 Ep10 RC: "Free Will" - Julia, Michele, and Tai win. Yet another endurance challenge. Contestants must hold two discs (weighed down by ceramic pots) by their fingertips. 8.Joe is out quickly, then (25 min) 7.Scot, 6.Julia, 5.Tai, 4.Michele. (45 min) 3.Cydney. 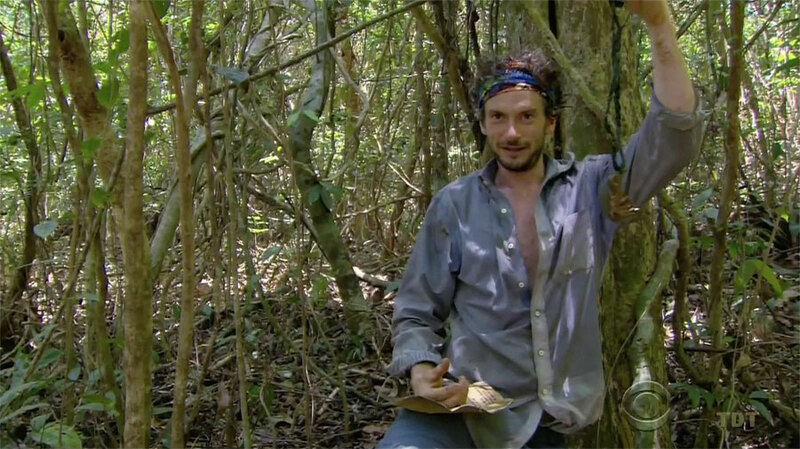 (1hr, 15 min) 2.Aubry finally drops, and 1.Jason wins. Ep10 IC: "This Much" - Jason wins. TC9 - Scot voted out (4-2-2), 7 left. Ep11: "It's a 'Me' Game, Not a 'We' Game" Ep12: "Now's the Time to Start Scheming" Ep13: "With Me Or Not With Me"
For no obvious reason, the challenge is done in tethered pairs. Jason draws wrong rock, cannot participate. Teams: Blue(Joe,Tai), Yellow (Michele,Cydney), Red(Julia,Aubry). Tethered together, contestants must cross obstacles, untie or retrieve 3 rings, then toss all three onto a hanging hook. Rings hooked: Cydney-1, Joe-1, Cydney-2, Joe-2, Cydney-3. Cydney/Michele win helicopter picnic (fried chicken, wine). 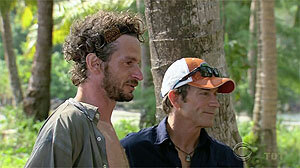 They pick Aubry to join them. Ep11 RC: "The Hook" - Cydney & Michele win, bring Aubry. 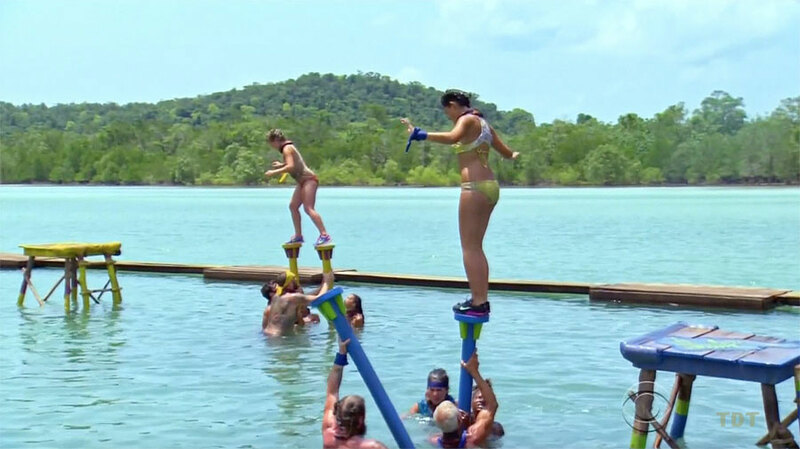 Contestants must wade/swim out into the water, across obstacles, to a platform, then memorize numbers connected to animal pictures, and use that to turn a wheel like a combo lock. 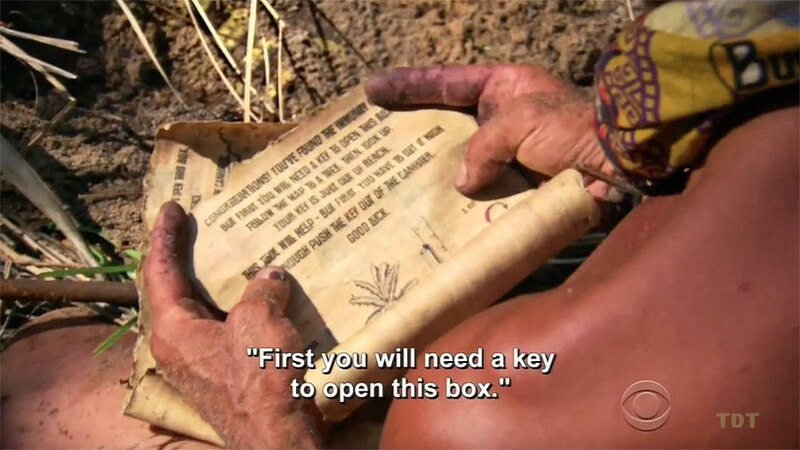 Once turned, they must untie a key and use it to unlock a box of letter clues. Then solve a word puzzle (BLINDSIDED). Jason tries, but gets wrong key, has to go back. Julia first to open box, then Michele. Joe wrong, sits out as others return to platform. Despite Julia's headstart on the puzzle, Michele wins! Ep11 IC: "Running the Numbers" - Michele wins. TC10 - Julia voted out (5-2), 6 left. 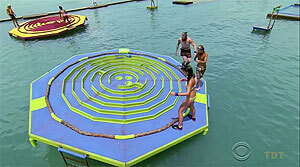 Contestants must cross water obstacles, retrieve three balls, then as a group, place all three balls in the center of a gigantic floating table maze,moving in sync to tip the maze in the direction needed. The yellow team (Tai, Michele, Jason) wins reward trip to Wildlife Alliance (an animal sanctuary), and an afternoon picnic. Ep12 RC: "Weight and Sea" - Tai, Jason & Michele win. 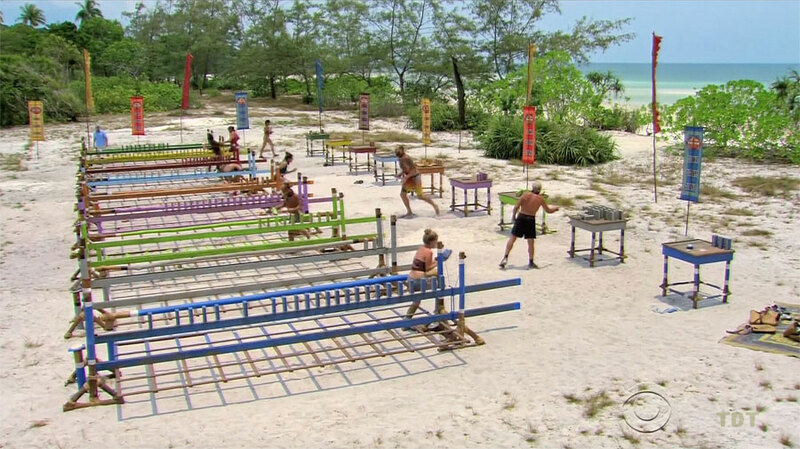 Contestants must hold a rope taut to stop a wobbly table from tipping, while, one at a time, stacking a series of blocks on the table to spell 'IMMUNITY.' Everyone does fine up to four blocks. Then Joe drops, then Michele, then Aubry, Jason takes the lead with 5, then dumps his stack. Cydney and Jason eventually battle for the lead, with 6, then 7, then all 8 placed. Going back for the win, Jason drops his stack. Cydney doesn't and she wins! Ep12 IC: "Got a Hunch" - Cydney wins. TC11 - Jason voted out (4-2-1), 5 left. Contestants must run into the jungle, climb a ladder to retrieve one of 3 sacks of 5 sandbags, run back, try to land the sandbags, one at a time, in one of five holes. Scoring: Cydney-1, Aubry-1; (all except Joe go back for second sacks) Aubry-2, Cydney-2, Aubry-3, Michele-1; (all except Joe get third bag, Joe gets his second) Aubry-4, Joe-1, Joe-2, Joe-3; (everyone else out of bags, have to wait for Joe to finish before replenishing, Joe gets third sack) Joe-4, Joe-5. Joe wins overnight getaway, takes Aubry & Cydney. 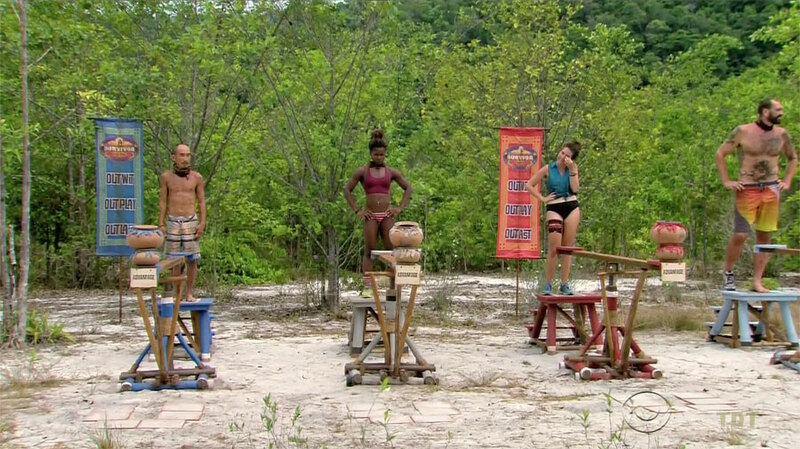 Ep13 RC: "5x5" - Joe wins, brings Aubry & Cydney. Due to an inability to urinate, possibly exacerbated by constipation from his reward feasting, Joe is removed from the game on Night 34. Joe is medically evacuated, 4 left. 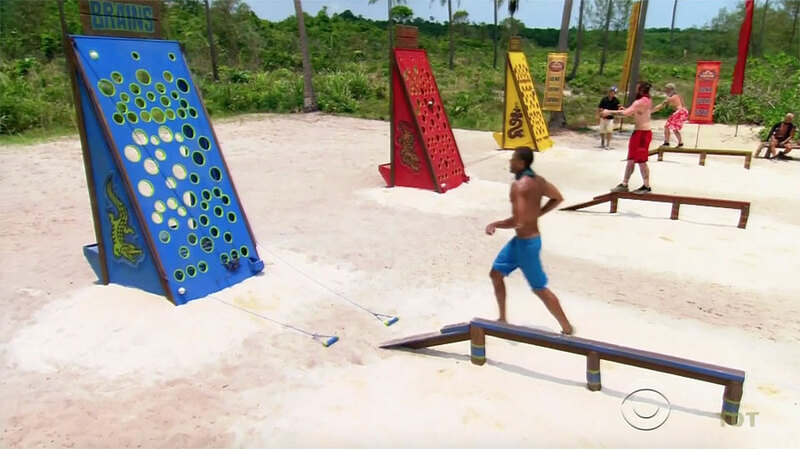 As in Worlds Apart, contestants must go under a net crawl, slide tiles along table, then carry as many as possible on machete across a seesaw and balance beam to a puzzle table, without dropping them or falling. Once all tiles are moved to the puzzle table, tiles must be paired up. Three tiles will not match, and will flip to reveal three numbers, which in some order open a combination lock. 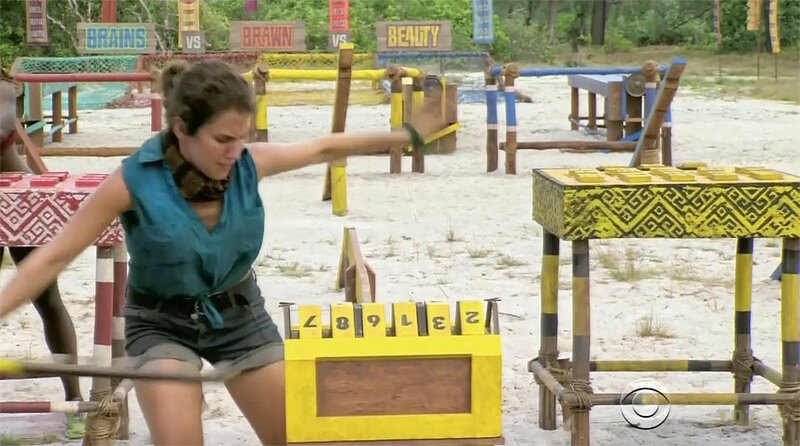 Aubry is the first across, but messes up her pairing. Tai and Cydney catch all the way up to trying combos, don't work. 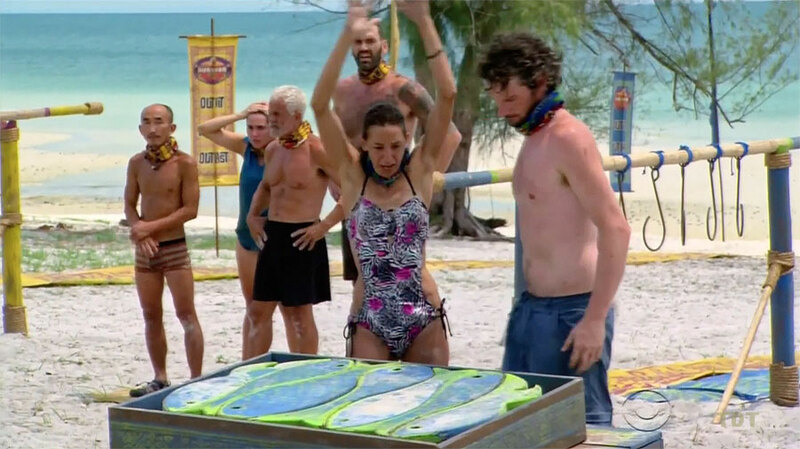 Aubry realizes her mispairing, gets it right, wins reward. She gets a feast in camp, brings Cydney. 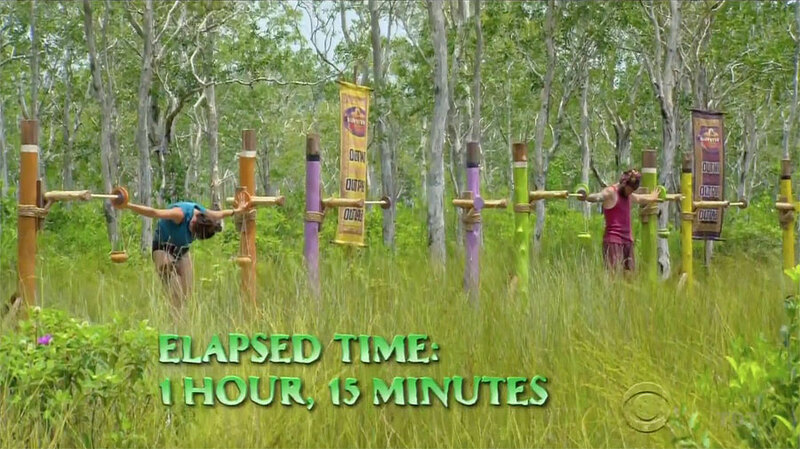 Ep14 F4 RC: "Home Stretch" - Aubry wins. 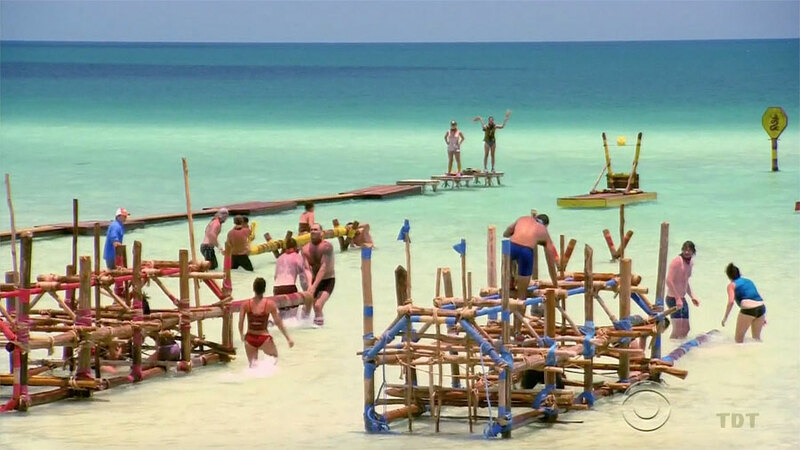 Contestants must run out into the water, get a key, run back, unlock stairs, get another key, run out, unlock a bag, run back, use a rope/ball to snag a ladder, release it, get another key, run out again, release a pole, get a bag of puzzle pieces, then climb to the top to solve a three-layer puzzle. Aubry is the first back, followed by Cydney, Tai, Michele. Tai has an early lead on the puzzle, but Michele passes him on the final layer, and wins immunity. Aubry and Cydney are still working on the first layer. Ep14 F4 IC: "Gimme Three Steps" - Michele wins. TC13 - Cydney voted off (2-2), 3 left. 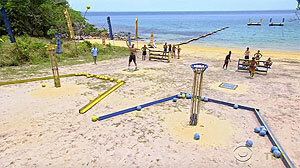 Contestants must stack 6 balls and discs (the unused 'dexterity' leg from the Ep1 RC/IC). 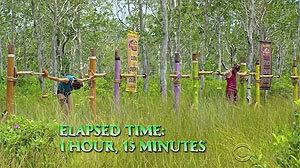 Michele and Aubry end up in a tight race at the end. Aubry finishes first, but her stack falls over as she removes the fork. Michele's doesn't so Michele wins the chance to remove a juror. Ep14 F3 RC: "Stacked Up" - Michele wins. TC14 - Neal removed from the jury. Michele beats Aubry and Tai, respectively, 5-2-0. Final Tribal Council and jury votes on Final 3. Worlds Apart finale airs one week from today.